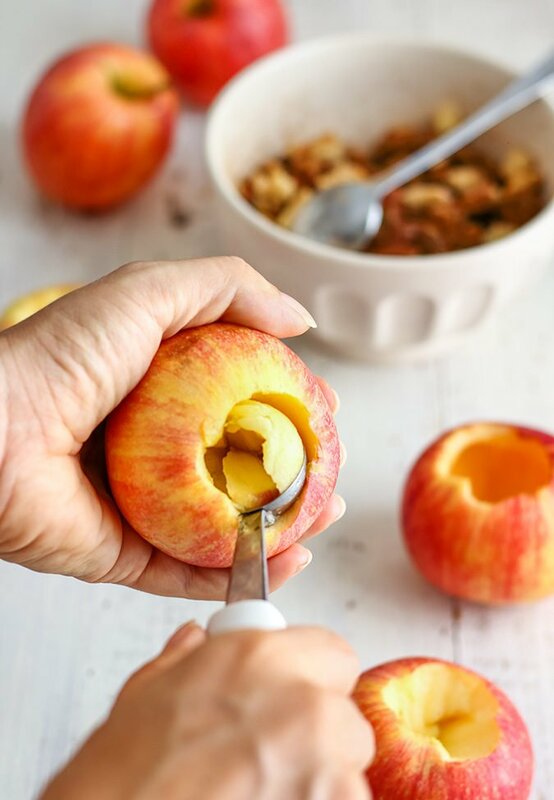 Instant Pot Baked Apples are a must-try Fall dessert that only take 3 minutes until cooked to perfection! Instant Pot Baked Apples are tender, buttery and rich in flavor! 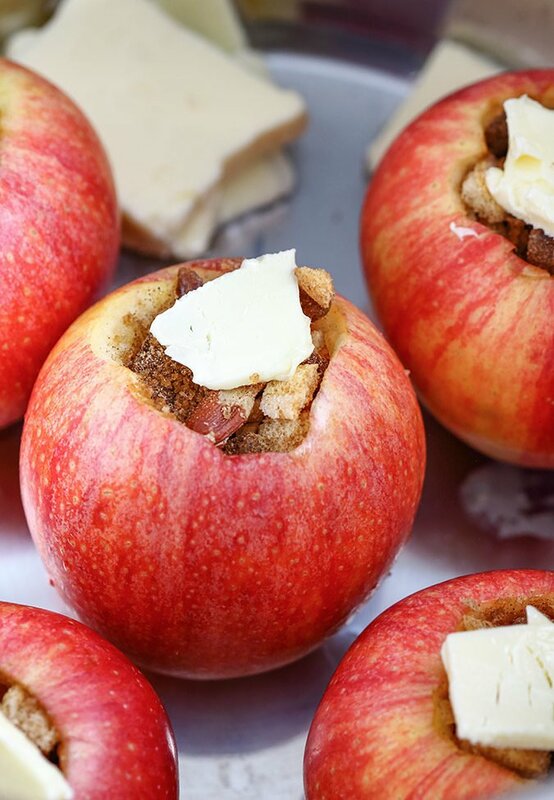 How many of you love oven baked apples? They are such a great treat especially in fall and winter. Don’t you think? They taste amazing but they take a good while to bake. Usually I don’t mind waiting for my cakes or breads to be baked, especially when they are worth the wait – like this Honey Cranberry Bread or Red Wine Chocolate Cake but if I have a choice to make something faster, I definitely go for it! 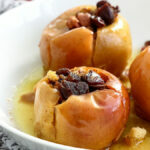 Believe it or not baked apples are so easy to make in your pressure cooker! If I was to bake them in my oven I would definitely have to count on 45 minutes baking time (depending on their size). 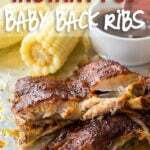 But throw them in your pressure cooker and they are ready in 3 minutes! 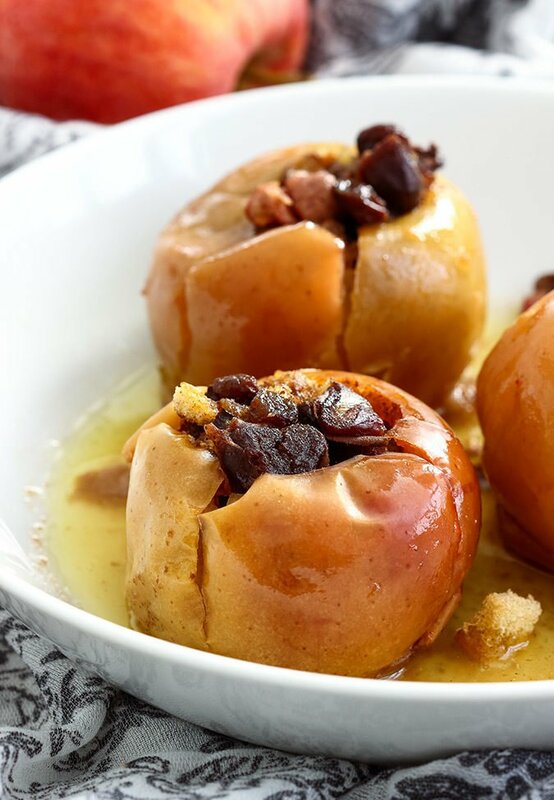 The best thing is that these Instant Pot baked apples are hassle-free. 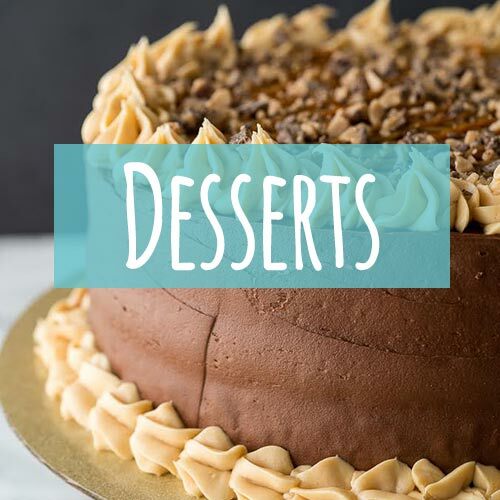 You can literally be cooking them while playing with kids outside, or doing shopping and if you come back you will have delicious warm dessert ready waiting for you! Bear in mind that Instant Pot needs time to build up the pressure which takes about 10 minutes in this case. I like to release the pressure naturally so this also takes about 10-15 minutes. So yes, it’s an extra time BUT you don’t have to be around at all! The pot does it for you! If you are not a huge fan of soft baked apples, then you’ll want to quick-release the pressure. This will stop them from overcooking. The filling is a mixture of hazelnuts, dates and ladyfingers! Yes, I used ladyfingers! Trust me. By the way, I also made these Instant Pot baked apples with some leftover cookies and we loved both versions. All I did was take one or two cookies and crush them into raisin-size pieces and mixed with the rest of the ingredients. Both are great options! 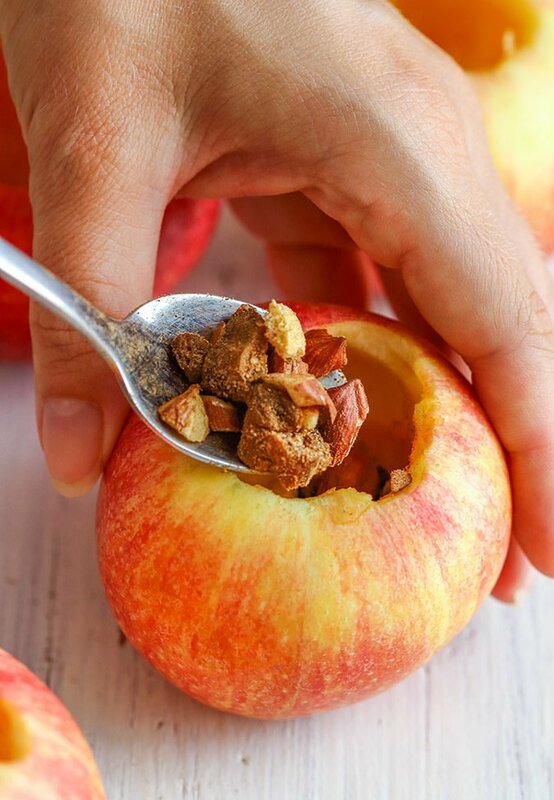 For this recipe I used honey-crisp apples but you can use any variety you like. The filling mixture is enough to fill 6-8 medium apples. This will also depend on the size of the cavity you make in each apple. I love using a melon baller to make the cavities. It works so well! 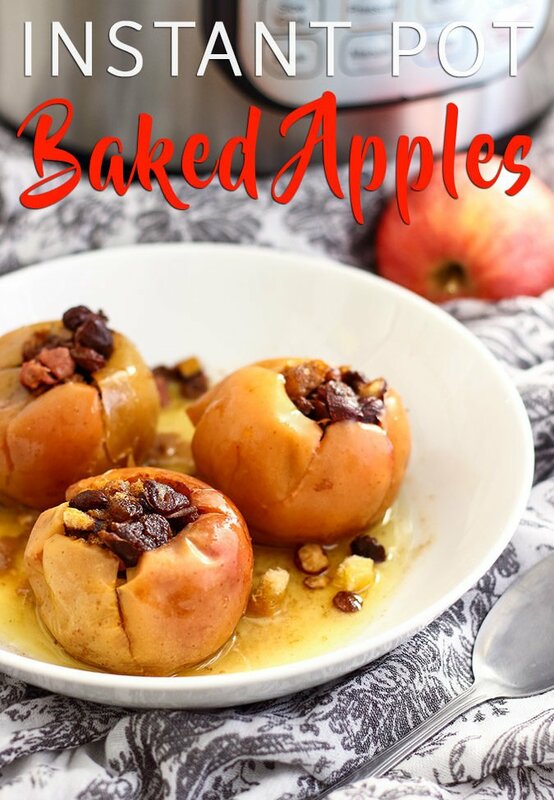 If you try these Instant Pot Baked Apples, let me know what you think! 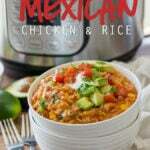 Check out more Instant Pot recipes HERE! In a bowl mix together cinnamon, chopped dated, chopped hazelnuts, brown sugar and crushed ladyfingers/cookies/Graham crackers (this is completely optional). Rinse the apples and cut out holes in each one of them. I use a knife and a melon baller. When the cooking cycle is finished, let the pressure release naturally to get extra tender apples. You can also quick release the pressure which will stop overcooking your apples. After the initial 3 minutes, the butter wasn’t even melted and the apples were still fairly cold. If you refrigerate your apples like I do, increase the cooking time. I wound up repeating the 3 minutes under pressure 3 times before they began to get soft. I was using fairly small granny smiths. Good to know! Thanks for the tip Sherry! Thanks for the pressure cooker method. I’m making the usual stewed apple crumble but instead of just chopping them up, I’m going to totally try this invention. Didn’t get tender enough. Finished in the microwave. Seemed to come to Pressure a little quick and NPR only took 4 minutes. 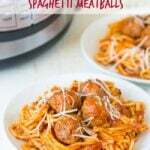 I left them in there for another 10 after that. .
Made this recipe exactly and loved it with one caveat. I followed the advice of letting the steam naturally release and had nice soft apples. They were so soft in fact that the skins slid right off. Being flavorless, it was kind of gross and bunches up a bit so I removed it. The next time I make this, I’m gonna try to peel the skin off after scooping out the center and seeing if they hold together as nice as these have. 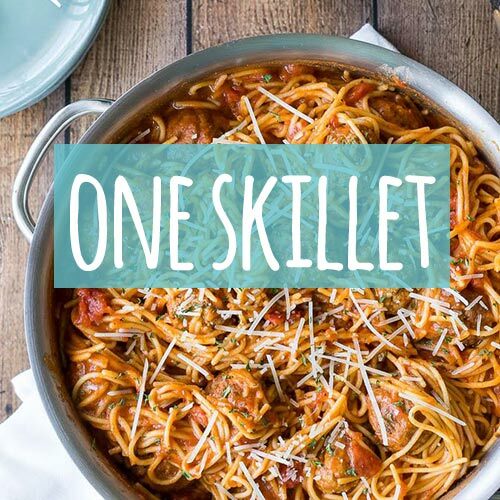 Otherwise nice and easy recipe! Do you use the wire rack or just put the apples on the bottom? You can do it either way, but I would think the rack would be a better option. My first pressure cooker fail. One out of four is not bad. About half of each apple exploded into mush while the inside half was under cooked. These two apples were on the counter for a couple of week so they might have been just too ripe. Julie, I don’t use the wire rack. I am not sure what the problem was but they should be definitely cooked through. As for the exploding – maybe try using larger apples next time and let the pressure drop naturally. Hope this helps. I put them in the bottom. Had to rest the 6th Apple I never the middle of the other 5. They all cooked the same. 3 minutes in the microwave finished them. 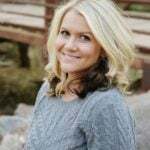 Maybe they were too big. They are good, though. Worked really well! success one of my first instant pot tries!